ST. GEORGE – The St. George Fire Department responded to a fire at the airport hill, south of the Little Valley area of St. George, Wednesday night after receiving reports that a bonfire built near a cliff edge had fallen off the side of the cliff while it was burning. 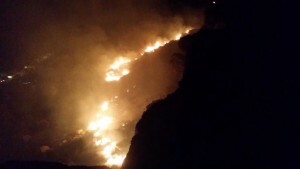 The fire was reported shortly after 10:30 p.m. and encompassed about an acre, St. George Fire Capt. Coty Chadburn said. It took some time for fire responders to access the fire’s location because the terrain in the area where it was burning had a lot of ledges. “We just let it burn because it was ledging up,” Chadburn said. The fire was completely contained shortly after midnight, with responders remaining on scene for about an hour after that to mop up hot spots around the edges of the burned area so the fire would not reignite. Though a bonfire was reported as the initial cause of the blaze, Chadburn said, they had no evidence to determine that a bonfire was the source. The cause of the fire was reported as undetermined, and no suspects are being sought for causing the blaze. Cami Cox Jim got her start in journalism way back in third grade, when she published a crayon-and-pencil classroom newspaper in Mrs. Gifford’s class. She’s been a professional journalist (the kind that gets paid) since 2005. Cami and her husband don’t have any “real” children yet, so for now Cami takes in stray animals, unofficially adopts other people’s kids and maintains high hopes for her own children (of the two-legged variety) to come along in the future.